Let's look at the market's performance on 6th April, 2019. GoDaddy had seven of the top ten sales yesterday led by ChefD.com which sold for $11,850. NameBio recorded 290 sales $100+ for a total of $121,307 with an average sale price of $418. Compared to the previous day there was a decrease of 10% in the number of sales and the total dollar amount decreased by 39%. We also recorded an additional 1,300 sales below $100 for a total of $33,638. 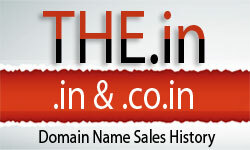 The domain ChefD.com sold for $11,850 at GoDaddy for an increase of 239%. It last sold for $3,500 on September 3rd, 2014 at Private. The domain GeoMarket.com sold for $2,025 at GoDaddy for an increase of 157%. It last sold for $787 on April 10th, 2016 at NameJet. The domain CraftStreet.com sold for $306 at GoDaddy for a decrease of 69%. It last sold for $990 on January 2nd, 2012 at Sedo. The domain PurePhotos.com sold for $135 at GoDaddy for a decrease of 83%. It last sold for $800 on April 21st, 2010 at Sedo. The domain FreeDiscount.com sold for $710 at NameJet for a decrease of 93%. It last sold for $10,000 on February 15th, 2007 at Afternic.